On Sept. 8, 1966, television watchers went on their very first trek with Captain Kirk and his crew. Some 45 years later, the "Star Trek" franchise is still cruising at warp speed, with a rebooted movie series off to a successful start at the box office, and all the various old television series still airing widely in syndication. Ask any Trekkie — or "Trekker," as some prefer — why "Star Trek" has become such a cultural icon, and he or she could give you a bunch of reasons, from the memorable characters to the cool futuristic technologies. Devoted fans might even answer in Klingon. "One of the things about 'Star Trek' is that it gave a hopeful view of the future, which I think is rare," said Lawrence Krauss, a theoretical physicist at Arizona State University, director of the Origins Initiative and author of "The Physics of Star Trek." "It's a future in which our knowledge, particularly in science and technology, actually makes society better." 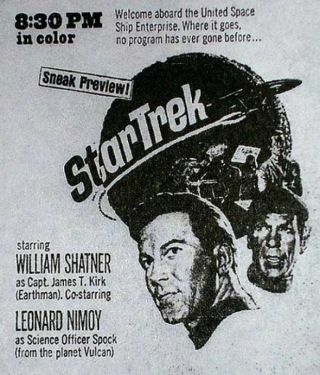 Timing, in this regard, was a big factor in why the original "Star Trek" series resonated long past its three seasons on the network television. "Star Trek" came out during the height of the space race, when the United States poured money into the Apollo program to put men on the moon (which NASA succeeded in doing in 1969). "It's good to remember we landed on the moon just three years after the first episode," said Sidney Perkowitz, a physicist at Emory University and author of "Hollywood Science." "Ten years later or earlier, it [the show] might not have clicked." William Shatner arrives at the Intrepid Sea-Air-Space Museum for a screening of his new "Star Trek" documentary, "The Captains." Paired with the theme of technological advancement was the show's expression of social progress. The original series had its finger on the pulse of the 1960s, "a very volatile time in our country's history, and [the show] was not afraid to engage social issues," Bernardi said. It addressed the issue of race relations, for example, "pretty much head-on though casting," Bernardi told Life's Little Mysteries. The multicultural bridge crew included a member of African descent (Uhura), East Asian descent (Sulu) and Russian descent (Chekov), all serving alongside a veritable alien from another planet, Vulcan (Spock). The later spinoff series made a tremendous point about showing different genders and races (human and alien) occupying the top command positions and working together. "I think ["Star Trek"] has a wonderful subliminal message about how we all ought to be able to get along," Perkowitz said. In his book "Star Trek and History: Race-ing Toward a White Future," Bernardi sees a Eurocentric bias in the series. But he said the show has helped move society forward, offering the example of Mae Jemison, the first African American woman to travel in space. Jemison, who turned 10 during "Star Trek's" first season, has said seeing Uhura onscreen inspired her to join NASA. "You can't underestimate the power of that," said Bernardi. "That's popular culture at its best." Real-life NASA astronauts Michael Fincke (right) and Terry Virts (left) dressed in Starfleet garb with actor Scott Bakula, who portrays Captain Jonathan Archer of the starship Enterprise NX-01, during taping of the final episode of Star Trek: Enterprise. This irreverence allowed the show to take "social issues seriously, but not itself seriously," Bernardi said. The later movies and series followed the formula of the original series to a certain degree, continuing in the vein of social progress without heavy-handedness. "I think those three elements prove pretty powerful for television," Bernardi said. Krauss agrees that the later spinoffs, from "Star Trek: The Next Generation" on through "Enterprise," "were able to take similar themes and update them" for next-generation audiences. Overall, the "Star Trek" franchise looks set to warm the hearts of Trekkies for years to come, with a new movie slated for next year and fan fervor still strong. As Spock might say, "Star Trek" will continue to live long and prosper. This article was provided by Life's Little Mysteries, a sister site to SPACE.com. Follow Life's Little Mysteries on Twitter @llmysteries, then join us on Facebook.